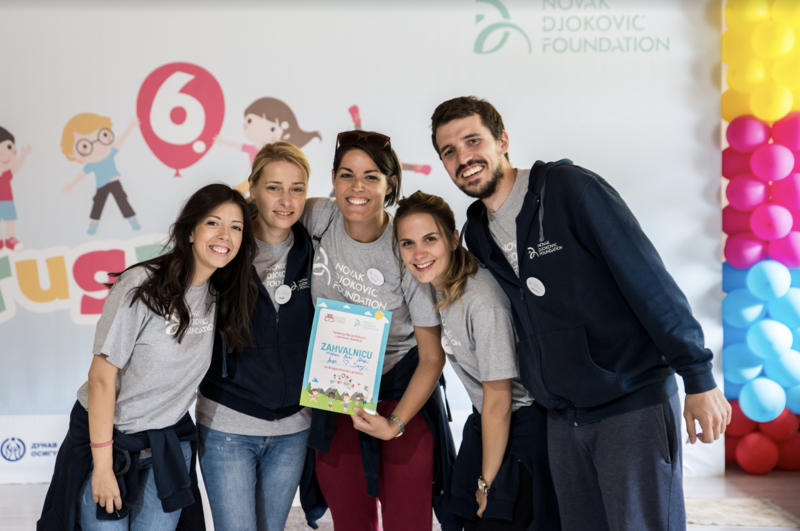 Mr. Marko Kovacevic and Ms. Andjelka Janic, peers at the Faculty of Political Sciences, Department of Social Work and Social Policy, plunged into their college experience by volunteering at Novak Djokovic Foundation back in 2013. Today, aged 28 and after a 5-year engagement, firstly in the projects entitled “Friendship Games” and “Schools of Life”, and later in more than 30 other projects exceeding the worth of 11 million Euros, they are now at the helm of the project team consisting of altogether six members. Their work was immediately noticed and appreciated, and today their team is engaged in strategic planning and implementation of even more complex projects. Everybody can be great…. because anybody can serve. The only thing you need is a heart full of mercy and compassion. A soul filled with love. Martin Luther King could do just that, bring the people to their feet in such a powerful way, jolt them out of lethargy, boost their adrenalin, and encourage them to do exactly what they had always wanted to do. Some people have been blessed with such a spirit. “If we want better and safer future to become more than just a pipe dream, then we need to include more volunteers than ever, the former UN Secretary-General, Kofi Annan said. 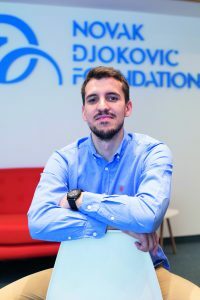 Mr Marko Kovacevic and Ms Andjelka Janic, peers at the Faculty of Political Sciences, Department of Social Work and Social Policy, plunged into their college experience by volunteering at Novak Djokovic Foundation back in 2013. Today, aged 28 and after a 5-year engagement, firstly in the projects entitled “Friendship Games” and “School of Life”, and later in more than 30 other projects exceeding the worth of 11 million Euros, they are now at the helm of the project team consisting of altogether six members. Their work was immediately noticed and appreciated, and today their team is engaged in strategic planning and implementation of even more complex projects. So, how does one become a young leader in the first place and is just that, being a volunteer, and taking the plunge wholeheartedly, something that makes the difference in the end? “I personally believe that volunteering is the first step towards the professional development as you gradually go through all the stages and processes with the help of your fellow colleagues and you get your foot in the door. On the other hand, MARKO KOVACEVIC says that there is no “special’’ key which opens the door to a young leader. He says that he strongly believes that both open approach and curiosity enabled him to decide on the pathway he wanted to pursue, but that every following challenge was unique to itself and that one cannot simply draw on curiosity itself. “In this day and age, young people have access to a large amount of information and although it is an advantage I think that it prevents us from developing skills as to how to stay focused on the facts. Everyone is ready to express an opinion, share a ready-made solution and derail the train of thoughts in one direction. It seems to me that it also prevents us from engaging our critical mind and observing all the available options. One should not neglect other people’s experience and advice, and I strongly believe that it is vital to compare such experience with one’s own, or if we lack such then to compare it with our own values and philosophy of life. The perception from different angles, like walking a mile in another person’s shoes, opens a much broader perspective and fresher take on life. “When taking the plunge into volunteering, each person has the opportunity to experience the organized approach to work for the first time, that is, to see what it means to be engaged in a particular organization, in the specific position or to play the specific role in the team. Whether this is about a short-term event or a continuous engagement in either one or several projects, volunteering can provide you with the insight into the specific activity, that is, into expectations involved in the engagement as well as into both advantages and disadvantages of such an engagement. If approached in the right way, volunteering can represent a unique experiment to each individual which may help give answers to certain questions: What is work? What does it imply? How does an organization or institution work? What are its main goals? In what way are these set goals met? What is expected from each employee? What are the values that are cherished? ANDJELKA says that is quite normal to feel bewildered, firstly when transitioning from a high school graduate to a freshman student, and later from a student to an employee. Although that period of life is behind her, she nevertheless sympathizes with young people today. “As a volunteer you are given the opportunity to learn the ropes within the organization and thus gain trust, and gradually climb up the social ladder by investing great effort and doing a lot of work. More importantly, as someone with no experience whatsoever, you are given the opportunity to slowly gain some, to learn from others and allow others to learn from you, as well as to explore your professional pathway and thus spread the network of your acquaintances and friends. Marko says that the organization you are a part of plays an important role in volunteering since the approach to work and the needs of each organization are different, which means that volunteers can expect to assume a whole host of different obligations. “Like everything else in life, volunteering allows you to experience both positive and negative things, and it sheds light on what interests us the most and what interests us the least, what is that we wish to commit ourselves to and also it helps us take a stand and shape our views of life. Marko further accentuates and adds that volunteering for him represented the opportunity “to form his own opinion and in a way narrow down his fields of interest to what interested him the most and to what he was willing to commit himself to entirely”. “When considering the mission we strive for and goals we wish to accomplish, and especially when bearing in mind the name behind the organization, everyone’s role bears great responsibility.” Andjelka further explains. “Firstly, we are deeply grateful to our founders, to both Novak and Jelena, as we have been given the opportunity to do the best job ever and address essential questions with regard to development and education of our children. Furthermore, both of them pay a lot of attention to employees’ training sessions. They are supportive of any kind of additional education, training session and are always willing to recommend a good book. I graduated from the Faculty of Political Sciences, majored in Social Work and Social Policy, and later earned the Master’s degree in Business Performance Management at the University of Belgrade. The link between human science and skills in the field of management provided me with a good starting point. Implementation of acquired knowledge is as equally important as the capacity to become aware of what we lack, after which we need to find a room for improvement. In my view, the hands-on training is far more valuable as we operate across Serbia, and every part of Serbia is different; every region throbs with its own life and has specific characteristics that influence the way we work and implement our projects. We are in the position to meet the children who lack basic financial funds for either preschool or elementary education, who are even deprived of basic living conditions, but who have taught us so much about life. Marko, on the other hand, explains that issues reloving around the importance of formal and informal education are divided and which of these two should have or already have a bigger impact on a person. “When I was coming to the end of my studies, I experienced various fears typical of that age such as: What do I know about work or life in general? Did I learn anything in the last four years? What am I to do next? I believe that these are the common questions asked by many students at the end of the study programme and as such, they speak volumes of a fact that formal education is insufficient when starting out. When I started to volunteer and later work at the Foundation, at first I was pretty sure that the University had not been of any help in terms of understanding the work itself nor in terms of what I wanted to do in the field I had studied. However, once we overcome the initial jitters and fears of making a mistake, the knowledge that we gained at the University slowly started to gather pace and correlate with the experience, thus opening our mind to new ideas and thoughts. “I believe that the truth lies somewhere in between. Formal education allows us to experience a broader perspective of the world, it provides us with the knowledge and information we need which can either strengthen or shake up our views and values. This kind of education provides us with a solid base for the future. “Our projects aim to provide access to early childhood education in poorer regions across Serbia and improve children’s living conditions. Our work is based on a partnership with all the participants who are relevant to a child’s development and together with parents, teachers, and representatives of preschool institutions and local municipalities we strive to provide children with more stimulating, creative and safer environment in which they will be able to grow and prosper. We are very thorough in each segment of our work because the projects themselves are complex and require long preparation, implementation, and monitoring. The “School of Life – Together for Childhood” project represents one of the most important strategic projects. On the one hand, we adapt and equip the space with didactic material well suited to children between three and six years of age, and on the other, we provide training sessions to teachers to help them improve their abilities when working with children. Schools are places in which children, parents, professionals and all those with a potential to promote the idea of children as equal members of the society meet every day. Children have the right to grow up in a stimulating environment, in a place where they can play and learn through play with other children, where they can solve problems and forge lifelong friendships. We want those places to become something more – hotbeds of goodwill in which human values and the care about the child and its development will be cherished the most. While on the field, we were also in the position to meet and speak with children aged between seven and ten who attend satellite learning classrooms in less developed regions so we could understand better the difficulties they face and get ideas on how to solve them. These kids, they wish to leave the confines of their environments behind, to socialize, explore, see other places and make new friends. Social differences in children get noticed in kindergartens and schools to a large extent. Many of these children do not have adequate clothes to wear, no school books or health cards, and many of them have never even been away from their families for long. Not even on excursions. Ever since then, our team has been tasked with providing them with the “Friendship Games” – the camp where they can do all of the things they’ve dreamed of and more. For the last six years, we have been gathering children from various satellite learning classrooms in the adjacent towns and cities, and this project is so dear to our hearts. Together we spend time in the mountain and learn about art, science, and sport. We play, we build memories and learn to overcome fears together, so it gets really difficult to separate from the kids after the Friendship Games are done. “Given the fact that I graduated from the Faculty of Political Sciences, Department of Social Work and Social Policy, I started thinking about what I wanted to do in life and in what way I would like to do my job. The driving force behind it all was a contribution to the community in a very concrete way. This kind of occupation is not that popular, and it takes great effort to solve particular problems (which are sometimes left unsolved) especially in the public sector where the financial resources are limited. When considering all of these things, in my view, engagement at a charitable organization allows you to contribute to the community in the true sense of the word. By making independent decisions and focusing attention on important projects, charitable organizations are able to commit themselves to solve specific problems in a practical and unconstrained manner, naturally, by adhering to rules and laws related to the field of interest, which is close to the dream of any social worker, Marko further emphasizes. Projects carried out by the Foundation aim to fulfill either one or several needs of children at their earliest stage of development and each project tackles such a need in a specific way. Whether this is about an educational camp built for children from poorer backgrounds such as the “Friendship Games”, or about enabling the access to early childhood education in places where there are no kindergartens for children such as the “Schools of Life”, or about providing parents with additional knowledge and support such as the”Support, not Perfection” project… each of these projects aim to solve some specific issue: to ensure that every child spends his or her childhood carefree, in the environment that will spur their development in every sense of the word. Of course, one person can never make much difference in the world, but a team of individuals with the same cause in their hearts can transform the world as we know it. To both of them, teamwork is essential for success. Marko further emphasizes the fact that each team member takes part in one or several projects either independently or in the team. “The advantage of our projects is that they are very dynamic and versatile, which allows us to gain experience through various activities. We also tackle various problems. Furthermore, our idea is to share responsibilities in line with our personal strengths and advantages so we can meet every aspect of the project in the best possible way. I believe that the key advantage of our team is volunteering experience as we had the opportunity to see how the Foundation works from within. Later we became members of the project team, after which we were presented with the amazing opportunity to contribute to further work and goals on a daily basis. In our case, that was something that brought us closer together, strengthened us and allowed us to react faster and more efficiently in respect to all expected and unexpected circumstances.